It's not only the mom-to-be that craves pickles, but your baby shower guests will too! This baby shower game, pickle game cards, will have your guests wanting to pull their tabs! You will receive 24 lotto style cards in your package, and the winning card is individually wrapped. 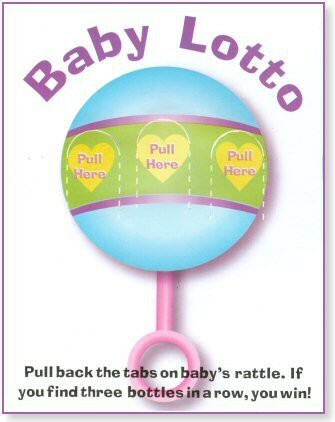 Each individual game card has three pull tabs with a baby object under the tabs. 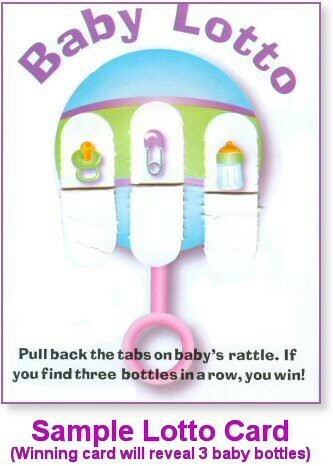 The winning card will reveal three baby bottles. Need a prize for the winner? Check out our shower game prize selection. Directions are included on the back of each card. Each guest receives a card, and the winner gets a prize. 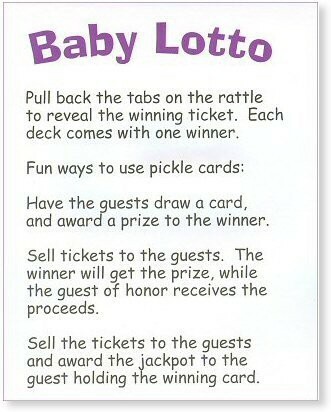 Another way to play is to sell the cards to your party guests, and mom-to-be gets the money while the winner gets a prize, or you could sell the cards to the guests, and the jackpot goes to the party guest holding the winning card. Each card measures 4 1/4" x 5 1/2". 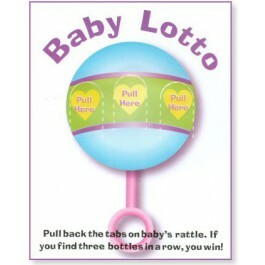 Package contains 24 lotto style baby shower game cards.